heart is just a bite away. 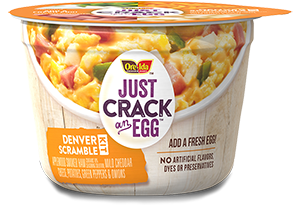 is just a bite away. in just under two minutes. *Amount in cup. 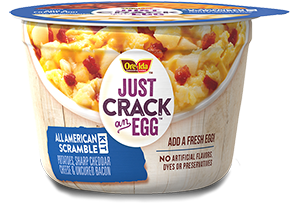 Prepared using 1 large egg contains 12g total fat (6g saturated fat, 0g trans fat), 220mg cholesterol, 390mg sodium, 4g total carbohydrates (<1g dietary fiber, 2g sugar), 15g protein. **Percent Daily Values are based on a 2,000 calorie diet. your daily values may be higher or lower depanding on you calorie needs. COOKED PORK BREAKFAST SAUSAGE CRUMBLES (PORK, SEASONING [SALT, SPICES, DEXTROSE, SUGAR, YEAST EXTRACT, SPICE EXTRACTS], VINEGAR, WATER, SODIUM PHOSPHATES); CHEDDAR CHEESE ([PASTEURIZED MILK, CHEESE CULTURE, SALT, ENZYMES, ANNATTO (COLOR)], MODIFIED CORNSTARCH ADDED TO PREVENT CAKING, NATAMYCIN [A NATURAL MOLD INHIBITOR]); POTATOES, ONIONS, GREEN PEPPERS, RED PEPPERS, CITRIC ACID. 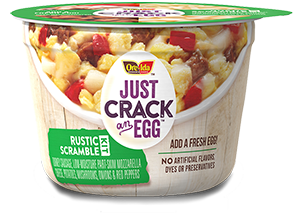 Find Just Crack An Egg in the egg aisle of a grocery store near you. 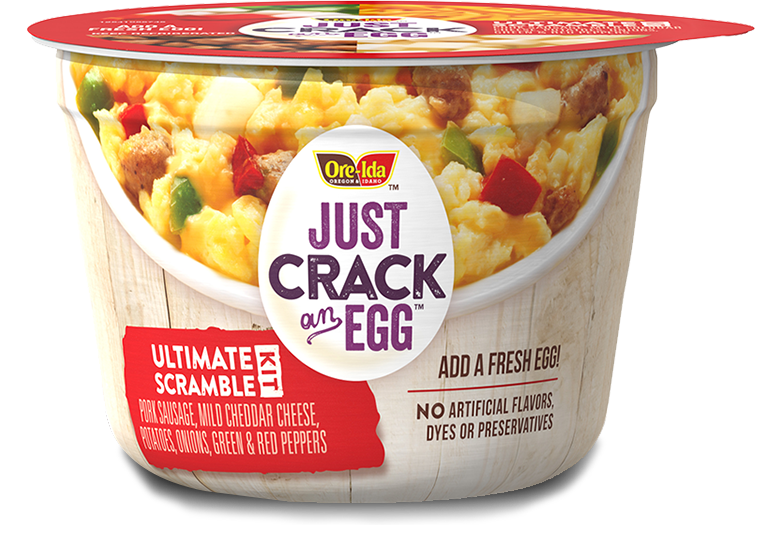 © Kraft Foods Group Brands LLC. All Rights Reserved.